Perched on its hillside at Emery Down, north-west of Lyndhurst, Northerwood House enjoys views across the New Forest to the Isle of Wight, and is itself visible for miles around. A large Georgian mansion, it is by any standards an imposing building. The 1784 Rate Books suggest ownership by Sir Philip Jennings Clerke, Bart, who also owned Foxlease and part of Parkhill. Robert Ballard, a Mayor of Southampton, seems to have occupied the house at this time. Other residents have included Charles Michel, who had estates in the West Indies, and is commemorated by a tablet in the parish church; Mr. Popham, a Volunteer movement enthusiast; and Lord Londesborough, who was responsible for encouraging Brusher Mills’ snake-catching activities, and was instrumental in the making of the cricket pitch at nearby Swan Green. 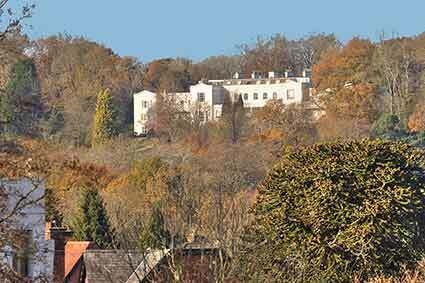 For a while Northerwood House was called Mount Royal following a visit in 1789 by King George III who, whilst staying at Cuffnells, came to admire the view. Richardson, King and Driver on their late-18th century map of the New Forest show the house merely as a symbol, but by the 1870s further details are shown on Ordnance Survey maps, including the site of an Ice House of which today there is no trace. (Such places were a common feature of large 18th and 19th century estates. Largely subterranean, they were used to store ice for kitchen use as a coolant and preservative. The ice was collected from nearby frozen pools, and latterly, was also imported from Scandinavia). Early in the Second World War, Northerwood House was used for a short time as a maternity home for mothers evacuated from Southampton, and later by the Army. After the War it was presented to the Forestry Commission who initially used it as residential quarters for forestry students, and then as training centre. In the late 1970s, it was converted to private apartments. Adjacent to the house, Northerwood Inclosure is shown by Richardson, King and Driver alongside a date of 1811. The inclosure as it is today, though, dates from 1860 when later plantings took place around the original woodland. It is predominantly oak and beech, with many invasive rhododendrons that have spread from introduced stock planted in the Northerwood House gardens. The thatched cottages at Swan Green were originally part of the estate, and were used as worker’s accommodation. In fact, Beehive Cottage, the oft-photographed detached cottage overlooking the cricket pitch, was once known as Northerwood Cottage.